Tiny sopraninoist: "Wait, I can play it faster, just let me Zen-out for a second..."
That's a good question, and my ideas are written out below. 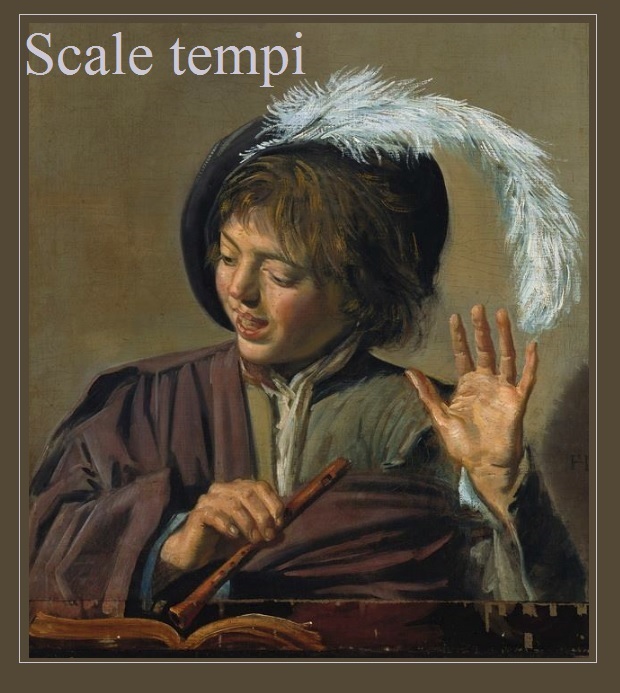 These ideas can be applied to any scale exercises, whether they are Taffanel and Gaubert, or Exam Scales (free pdf of melodic minors with articulations here. Free pdf of extended Major scales & Modes here.) or any of my free flute scales in pdf here, for novices and intermediates. They are all slightly different scale formulae, but my advice works with all of them. Play slowly, and experimentally, all-slurred for tone, putting easy-breathing pauses wherever you need them, so that you always play fresh with great energy and musicality. Let the metronome click on while you rest and breathe until you're ready to start again. Play effortlessly and beautifully, not for speed. In other words, break long exercises into really nice small chunks of music that allow you to be always fresh and easy with your air. What you are practising are ease and beauty, not speed, at first. Evenness of tone quality, and evenness of the fingers is more important than speed. Otherwise, you are fast but sound fuzzy and every scale is uneven for different reasons none of which you know. You are looking for areas where tone suffers, or combinations of pairs of notes where you hear finger "blips". These blips are usually: C to D, or E to F#, or the very often challenging high register cross fingerings with many fingers changing places at the same time. Flute stability is often the problem here. But finding these typical "blips" means you are working on the true problem instead of just repeating and ingraining the problems. Fix your "blips" with your teacher's help, if necessary. Look at your fingers while your headjoint is on your shoulder; determine which individual fingers are too high and which are too slow, and release tension and curve the fingers, letting them behave slowly together with lightness, touching the keys lightly before experimenting with depressing, and sensing the split-second of clean action with accuracy, (ALL before you put the flute back up to your lips again) and allow the fingers to become lighter and the hands to become more balanced and stable, as you gradually speed up the tempo, and eliminate un-needed extra pauses that you used to have when you played more slowly. The best way to eliminate "blips" when you're playing, is to simply change the rhythm from long-short, to short-long, to triplets, to sixes, to fives, to whichever division you can think of, and back to long-short, short-long again, to make every finger that used to be slow, fast again, and every finger that used to be too-quick, slow and measured and gentle again. click on picture to enlarge; use backbutton to return. Keep a beautiful tone. Always. No matter what the speed. If you lose your tone, quickly fix it using chromatic longtones and from your best note, slur note by chromatic note to the problem notes and fix the tone quality before proceeding. Allow the fingers to become lighter and lighter as you speed the tempo more. (No downward pressure means fingers lift effortlessly). Work in short, focused sessions. Eliminate any more pauses you used to have as you gradually speed the now perfectly even, beautiful notes. Play fluidly and musically, with and without the metronome, to determine the individual cleanest speed for each individual scale you're working on that day. Play slowly, stopping on different pitches with and without the Tuning CD. Find out which notes don't afterall require an embouchure adjustment. Be creative and at ease. Stay fresh! Break often so when you come back you can really focus again. When the tone, speed, and lightness are there, (and are delightful and effortless), add articulations and dynamics to vary the exercises from day to day. I find adding articulations too soon makes them heavy-sounding. Accuracy, tone quality and evenness win the day, and musicality is the overall goal. Clean and clear wins over speed, because speed is only one single element of clear, beautiful playing. 3. All my free flute scales in pdf are here.